So you remember that story, yeah? The one about D’banj and the now-famous interview with Ebony that we broke in Nigeria first and that got @DONJAZZY trending on Twitter? Yes, that one. Well, as it so happens – it never happened. After Nigerian media culled the interview and a frenzy ensued on and off the blogosphere, the Mo’ Hits team went into overdrive. 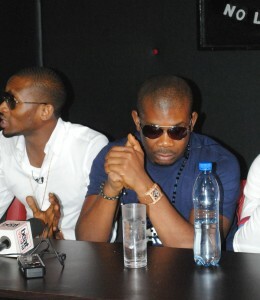 According to a source close to D’banj, there was a hot exchange between his co-label owner Don Jazzy (Micheal Ajere) and the singer over the controversial interview. Don Jazzy was livid that D’banj had claimed he solely owned Mo’ Hits. The back and forth led this morning to a “rejoinder” by D’banj’s new manager and publicist, Bankulli (Don Jazzy and the other artistes still go with Sunday Are, in the clearest sign yet of a split in the label) sent first to popular blogger Linda Ikeji. 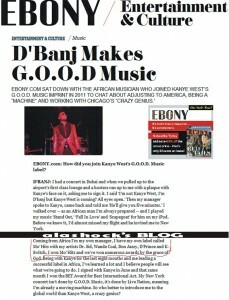 D’banj never had any such statement with Ebony magazine during the interview he did with them. We are in touch with the editor of the magazine on this and a correctional rejoinder will be published soonest..
As promised, the change was made. 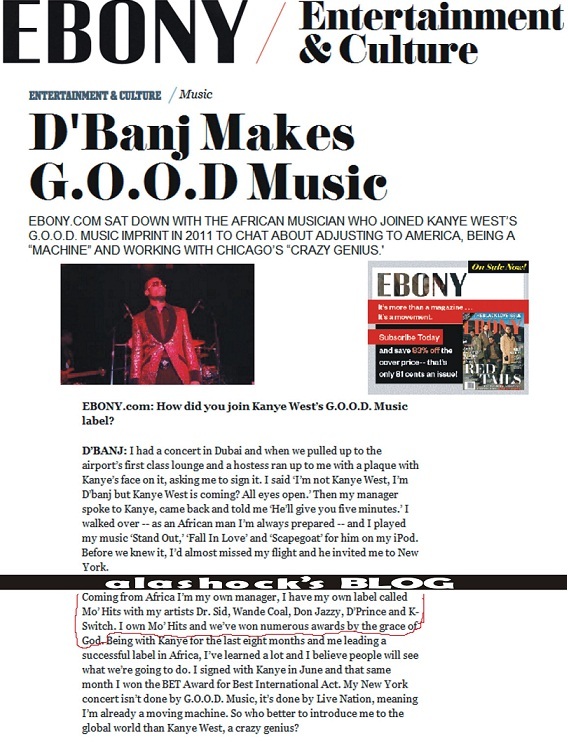 Earlier today, the Ebony magazine website quietly changed the text of the interview. It was a small re-arrangement of words, but it wholly changes the significance of the said statement. Interestingly, Ebony did not issue an apology, or indicate the update. Thankfully, a blog called Alashock saved a screen shot of the original story – and it’s interesting to compare. Coming from Africa, I’m my own manager, I co-own a label called Mo’ Hits with Don Jazzy and we represent artists Dr. Sid, Wande Coal, D’Prince and K-Switch. I own Mo’ Hits and we’ve won numerous awards by the grace of God. Being with Kanye for the last eight months and me leading a successful label in Africa, I’ve learned a lot and I believe people will see what we’re going to do. I signed with Kanye in June and that same month I won the BET Award for Best International Act. My New York concert isn’t done by G.O.O.D. Music, it’s done by Live Nation, meaning I’m already a moving machine. So who better to introduce me to the global world than Kanye West, a crazy genius? And so now, there is calm in the town of Mo’ Hits. But how long will this last? 2. I own Mo’ Hits and we’ve won numerous awards by the grace of God. All in this same story even after the edit.